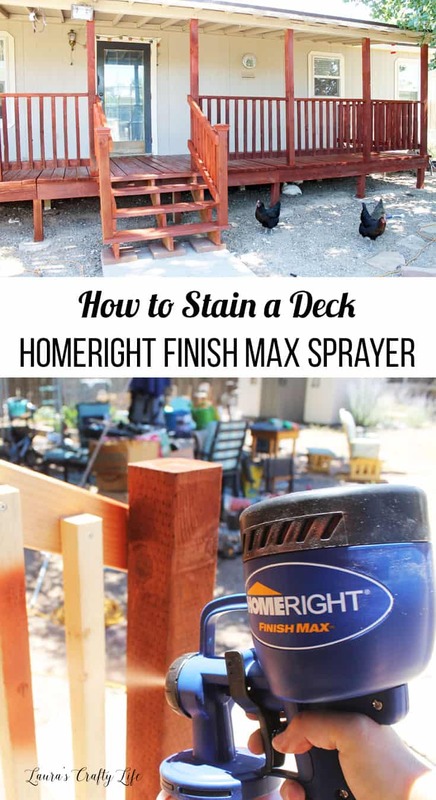 How to Stain a Deck: HomeRight Finish Max Paint Sprayer. 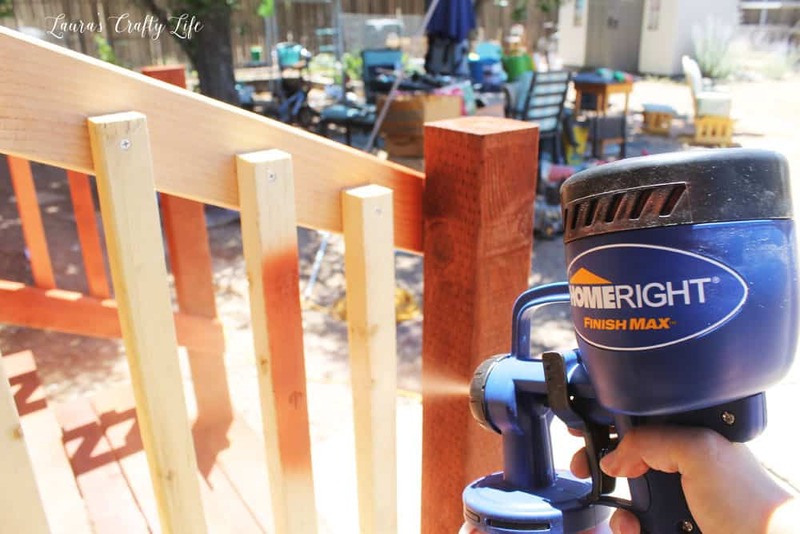 Use HomeRight Finish Max Paint Sprayer to stain deck railings easily and faster than with a paint brush. 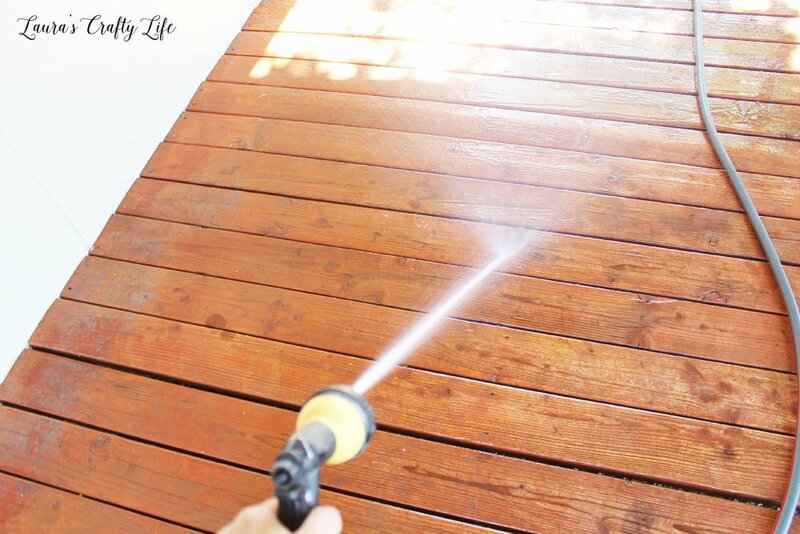 Last week I shared how to prep your deck for staining or waterproofing. Our deck was in desperate need of new stain and I had been putting it off because it was going to be a big project. Surprisingly, even though it was a lot of work, it went fairly quickly with some special tools. This post contains affiliate links. If you purchase something through the link, I may receive a small commission at no extra charge to you. Please read my full disclosure policy here. 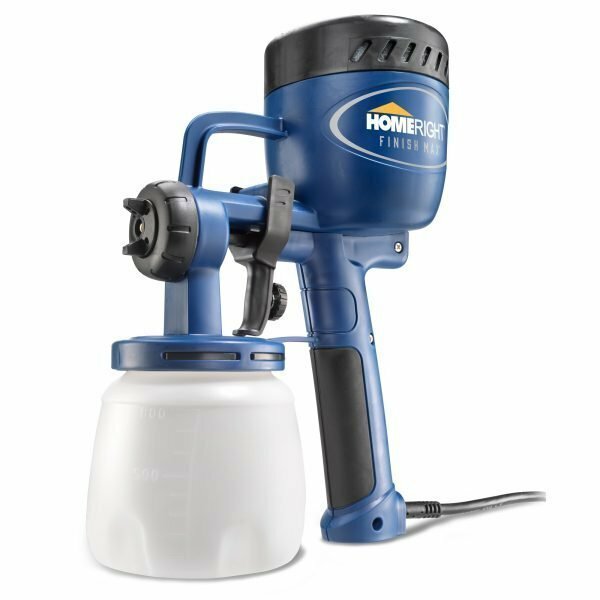 Thank you to HomeRight for providing me with a paint sprayer. Before staining be sure to properly prepare your deck for your stain or waterproofing. 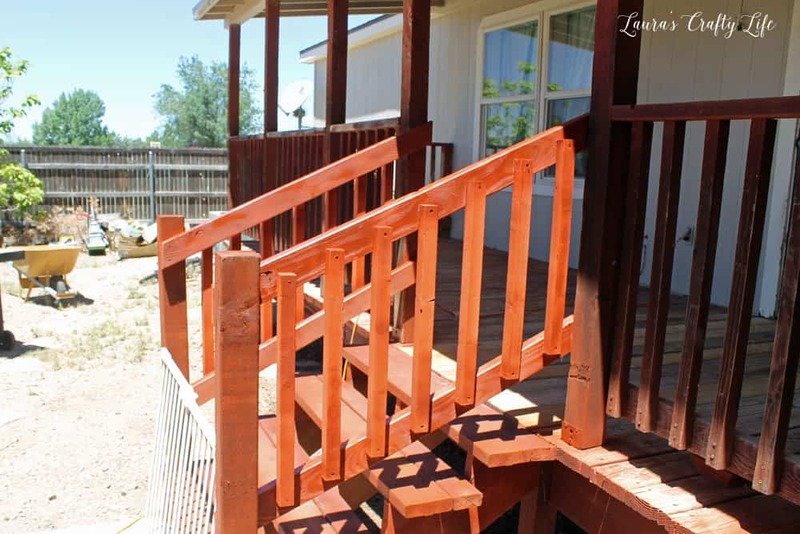 You may need to strip off the old finish depending on the new stain you choose, but at the very least it is a good idea to use a cleaner specifically made for decks, even on brand new wood. Depending on the stain you choose, you may be able to use it on damp wood. Other stains require that you use them on completely dry wood. Be sure to check the label on your stain to be sure you are prepping your surface properly. 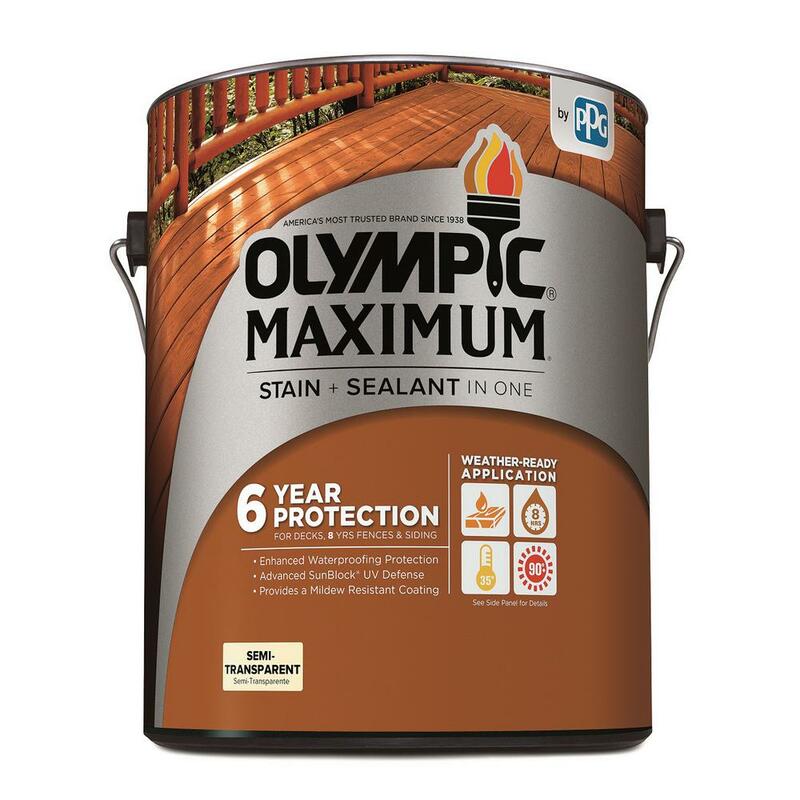 After researching some different types of stains, I chose the Olympic Max Semi-Transparent Stain that allows you to stain when the surface is still damp. Basically, you only had to be sure there was no standing water on the deck. It was also okay to stain up to 120 degrees, which in the hot Arizona sun during the summer was an important feature to me. Choose a stain that will hold up well for your weather conditions. If your wood is new you can simply use a clear waterproofing sealer to completely show the wood grain and color of the natural wood. You can go from transparent all the way to solid color stains. The more woodgrain that is showing will mean less protection from the elements. If you want optimal protection, choose a solid stain. However, this will show the least amount of woodgrain. I would recommend a semi-transparent, semi-solid or solid stain on an older deck. Note: Please be sure to read the entire label on your stain or waterproofing container to make sure you are using the stain in the optimal conditions for your particular stain. I have always dreaded staining the railings. It seems to take forever getting around all four sides of each post when using a paint brush. I was given a HomeRight Finish Max Sprayer to try out and I was looking forward to testing it out on this project. 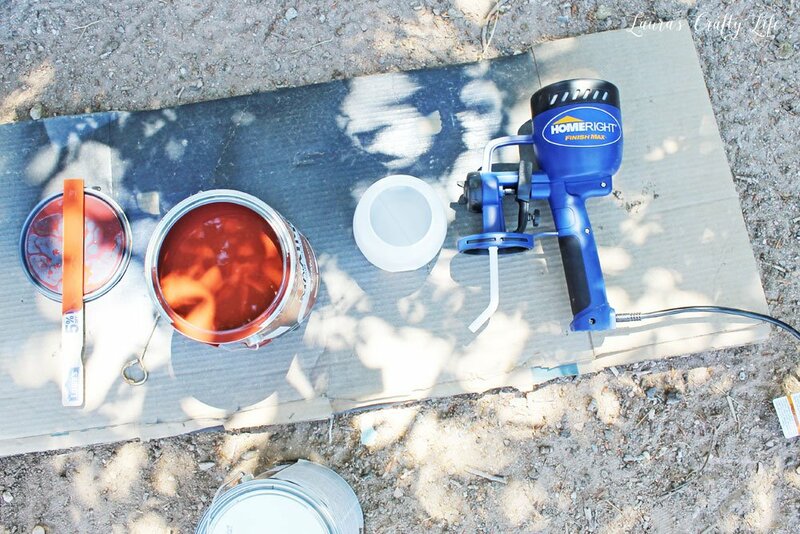 The stain can be poured directly into the paint vessel. If you are using the Finish Max Paint Sprayer with regular paint or a thick stain, you can test the viscosity with the included viscosity cup to see if the particular medium you are working with needs to be thinned prior to use. You can find all the details about thinning your paint in the manual. 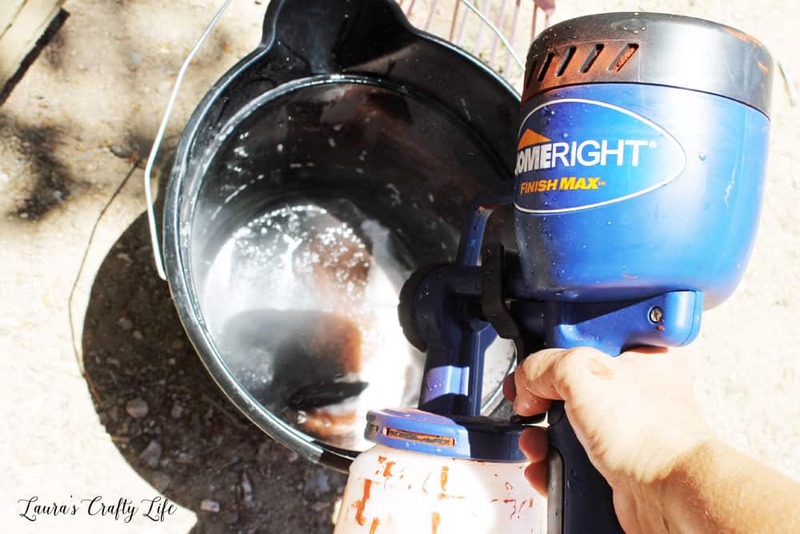 The Finish Max Paint Sprayer is ready to go right out of the box. Simply add your stain to the container and attach the pickup tube into the top part of the sprayer. Screw the container onto the sprayer. Plug it in and test out the sprayer on a scrap piece of cardboard before using on your actual progress. You can adjust the spray pattern to horizontal, vertical, or cone. Set the flow to “maximum” by turning the volume control knob fully clockwise. I was so excited about how quickly spraying the railing went. It took much less time than it would have taken me by hand with a paint brush. Start with the sprayer off your railing and then use smooth even strokes about 8 – 10 inches from the railing. Keep the sprayer level and use overlapping motions. It does not take long to get the hang of it. I started by doing the outside of the railing. I sprayed all three sides I could see of the railing posts. I also sprayed the top and bottom horizontal railing supports and the outside horizontal beams holding up the porch. Then, I stood on the deck and finished the inside of the railings. Our railing is attached to our house, and I didn’t want to tape it all off, so I stopped at the second to last railing post and used a foam brush to finish off the staining. I also used a foam brush to get the tops of the posts that hold up the porch roof so I wouldn’t accidentally spray the painted roof. 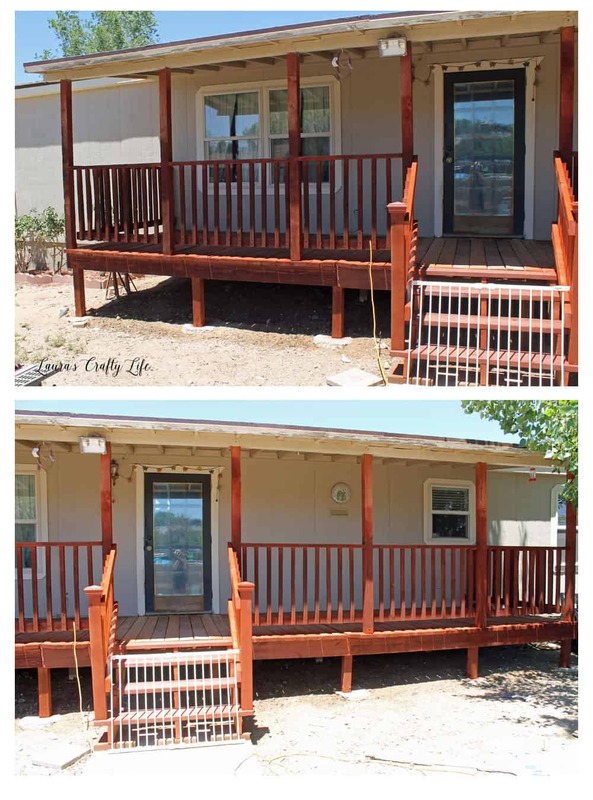 I used the paint sprayer for the deck railing, the stair railing, the bottom part of the support posts, and all around the bottom of the porch. I did not use it to stain the floor of the deck. I think I was most worried about having to clean the sprayer and how complicated or messy it would be. But it only took me about 10 minutes to clean it out. Next time I think it will only take me about 5 minutes since I know what I am doing. Pour any remaining stain in the container back into your stain can. Fill the container with warm, soapy water if using a water-based stain*. Spray the soapy water into a bucket and discard. *Note: Use paint thinner or the manufacturer’s recommended cleaning liquid to clean up instead of soap and water if using an oil based stain. Take apart the sprayer pieces, including unscrewing the front nozzle. 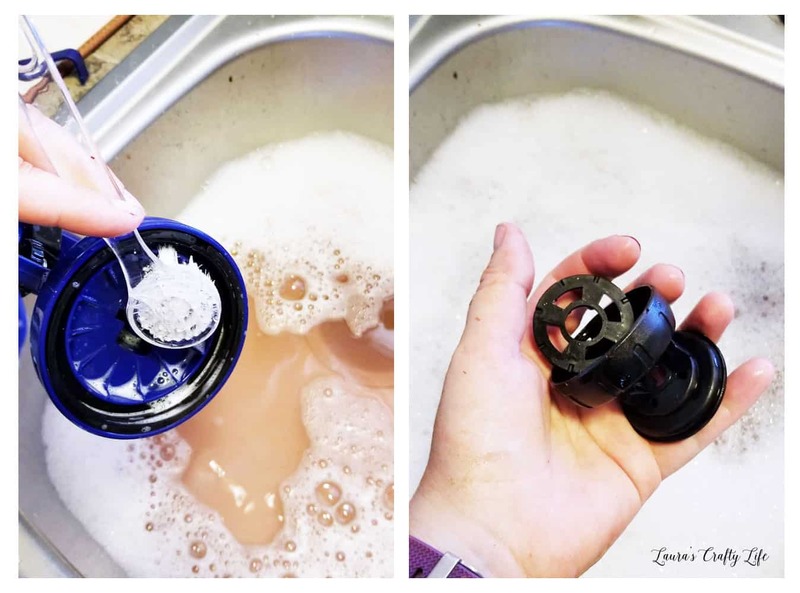 Wash all the parts in warm, soapy water. There is a little brush included to help get into all the crevices. Clean the sealing ring around the top part of the sprayer as well. Allow all the parts to dry thoroughly and reassemble. The paint sprayer will be ready to go for the next time. Note: For easier and faster cleaning, consider purchasing the Rapid Clean Kit. Check out how I finished off the floor of the deck using the HomeRight Stain Stick with Gap Wheel.